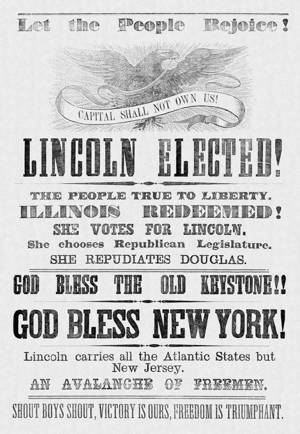 The Freeport Wide Awake, a campaign newspaper from Illinois, ran this full-page banner celebrating the election of Abraham Lincoln as president and the election of a Republican state legislature. Lincoln won with an Electoral College majority of 180 to Southern Democrat John Breckinridge’s 72, Constitutional Unionist John Bell’s 39, and Northern Democrat Stephen Douglas’s 12. The Republican attained only a plurality in the popular vote, 40% to Douglas’s 29%, Breckinridge’s 18%, and Bell’s 13%. The notice, “Lincoln carries all the Atlantic States but New Jersey,” means that he won the Northeast, not the Southeast coastline states.